• Faster speed with high torque performance, allowing helicopter to perform with faster and higher precision. • High rigidity, shock resistant metal gears with high strength composite alloy gears with durable structure characteristics. • Aluminum alloy mid case construction for instantaneous heat dissipation, maintaining servo's high efficiency. • Supports digital & analog control signal. 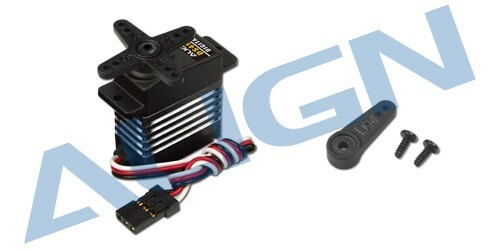 • Powerful and precise servo, suitable for T-Rex 250/450 rudder use. • Supports 8.4v high voltage input to provide optimal speed and torque performance of the servo.